There are three races of this uncommon endemic: affine in Palawan, striatiissimum in Catanduanes, Lubang, Luzon, Romblon, and Sibuyan, and aeruginosum in Cebu, Mindanao, Mindoro, and Negros. It is known for its unusual-for-a-flowerpecker habit of wagging its tail from side to side. The individual we saw was perched on a branch right above a Black-chinned Fruit Dove. 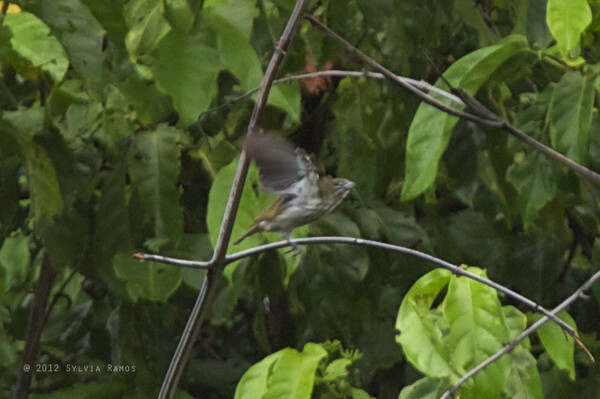 The Striped Flowerpecker is one of only three flowerpeckers found in Palawan. The other two flowerpeckers found in Palawan are the Pygmy Flowerpecker and the Palawan Flowerpecker.